The other night, I was passing time by looking at different profiles and pictures on the hairboards. I ended up going through some of my saved favorite pictures. Most of these saved favorites are from years ago, and the women all have bra-strap length hair and beyond. Then I took the time to go through my own picture collection, starting with my older pics and working my way up to my newest. I was just filled with complete and utter shock. I can't believe it, but I've been on my HHJ almost 3 years now. December 15th will mark my third year on my journey!!! I can't believe I'm just months away from reaching my ULTIMATE hair goal, WL hair. It's surreal to me, I mean I'm in a state of complete disbelief. 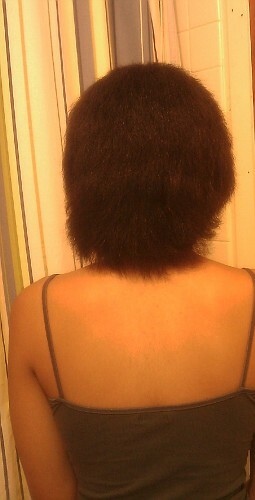 Here is a pic of my hair almost 2 years later, dated August 2, 2011. I'm so determined to get to WL ASAP!! I am going to reduce the amount of heat I use and bun my hair more frequently. I am also going to rely on flexirod sets, cheat rollersets, braidouts, and any other cute heat-free styles I can find!! I want to play with clip in pieces, and try making my very own homeade half wig. I really can't wait to get this wrap-up started ! I will be making videos again really soon you guys. I've been really blessed and I want to share the information I've learned with you all. Congrats!! I've been following your videos since you were "sexiisugarshelley" and the growth that you've experienced in two years is amazing!! Thank you Shika and Harmony !!! Shika, thank you for following me so lonnnnnng LOL.. that is such and honor :) I really appreciate you ! You are the reason I decided to do the BC a couple of months ago. Since your hair closely resembles mines, I look at your blog every month for inspiration and motivation. Your hair is beautiful, full, and lengthy. I can't wait to see how my hair looks in 2 years! Hell, I can't wait to see how my hair looks in two months!